On October 19, Charge d'Affaires a.i. 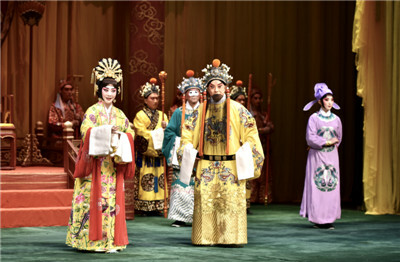 Zhu Qin and his wife attended the premiere of The Emperor and the Concubine by China National Peking Opera Company (CNPOC) at the Sadler’s Wells Theatre, London. The Rt Hon. Lord Sassoon FCA, Chairman of China-Britain Business Council, Kitack Lim, the Secretary-General of the International Maritime Organization, Kathryn McDowell CBE, Managing Director of London Symphony Orchestra, together with over 1,000 audiences watched the performance. “Peking Opera is the jewel of the Chinese culture. It represents the finest traditional Chinese art, displays the rich cultural heritage of the Chinese nation, and opens a window for audience of other countries to appreciate the style, charm and spirit of China. 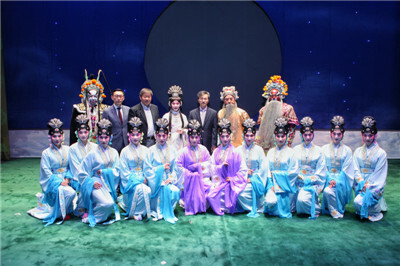 After the performance, Zhu met with the performers and expressed his sincere thanks to Yu Kuizhi, Li Shengsu and other artists for bringing the best of the Peking Opera to the UK for four consecutive years. He extended his congratulations to CNPOC on the success of the first night of its current tour. He hoped that CNPOC could provide more cultural feasts in the China-UK “Golden Era”. Xiang Xiaowei, Minister Counsellor for Culture of the Chinese Embassy was also at the premiere. 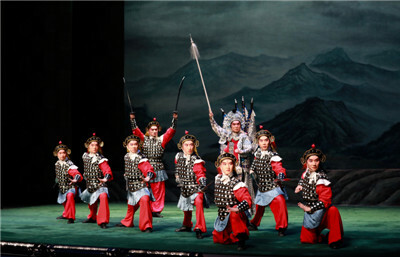 The Emperor and the Concubine was a major production of Peking Opera by Master Mei Lanfang in his early years. It was adapted from the legends of The Song of Everlasting Regret written by Bai Juyi and The Palace of Eternal Youth written by Hong Sheng. Its elegant and enchanting dances, songs, music and drama have fully embodied the essence and charm of the Mei School of Peking Opera. The enchanting performance of Yu Kuizhi, Li Shengsu and other artists, the intriguing legendary story and the dream-like stage set drew round after round of warm applauses from the audience. Besides the opening performance, the CNPOC also presented The Crossroads Inn/The Monkey King and the Leopard and The Emperor and the Concubine on the afternoon and evening of October 20th respectively.